Does Dropbox for Gmail require Chrome permissions? What if I see a "third-party cookies" error when I try to sign in to Dropbox for Gmail integration? What if the integration stops working, won't enable, or won't load my files? Chrome extensions, like Dropbox for Gmail, request certain permissions in order to make your browsing experience better. Dropbox for Gmail requires that you give permission to add Dropbox functionality to the Gmail experience. For example, these permissions make it possible for our extension to do things like save files to your Dropbox account, copy Dropbox links into the text of your emails, and show you previews of files linked from your Dropbox. If you try to sign in to the integration, but instead encounter a "third-party cookies" error message, it's likely because third-party cookies are blocked on your browser. 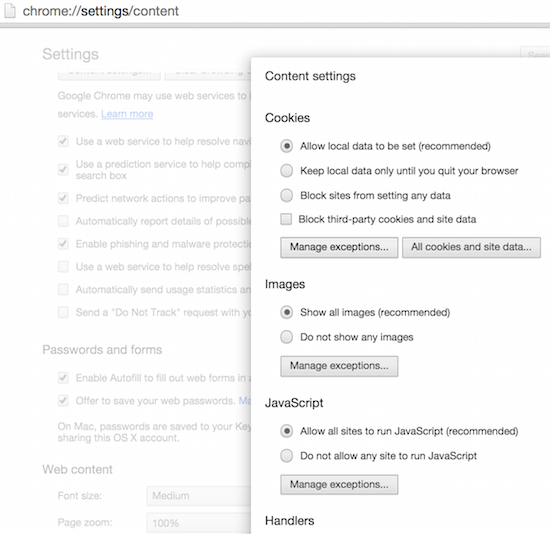 Enter "chrome://settings/content" in the address bar of your Chrome browser. If none of these quick fixes work, see Google's help center for more in-depth troubleshooting measures and for instructions on uninstalling extensions. Click the icon with three horizontal lines in the top-right corner of your Chrome browser. Hover your pointer over More tools, and then select Extensions. Find the Dropbox integration, and click the trashcan icon beside it. Click Remove in the pop-up window that appears.